The big news on the island is the new replacement bridge is coming to a completion. The replacement project has been in the works for many years and we are ready to celebrate its completion. Below is a brief timeline of the history of how far we have come in the transportation from Hatteras Island to the mainland. 1924: Capt. Toby Tillet started his ferry service across Oregon Inlet with a 2 car boat, costing just 25 cents to ride. Over the years, the ferry boat grew in size, allowing more folks to travel to and from Hatteras Island. 1951: NC State took ownership of the ferry system across Oregon Inlet. Tourism blossomed on Hatteras Island. The need for more efficient transportation for the number of folks wanting to come to the island became a priority. After seeing how much the ferry service cost to run each year, a plan to build a bridge over the span was initiated. 1963: Bonner Bridge was completed. 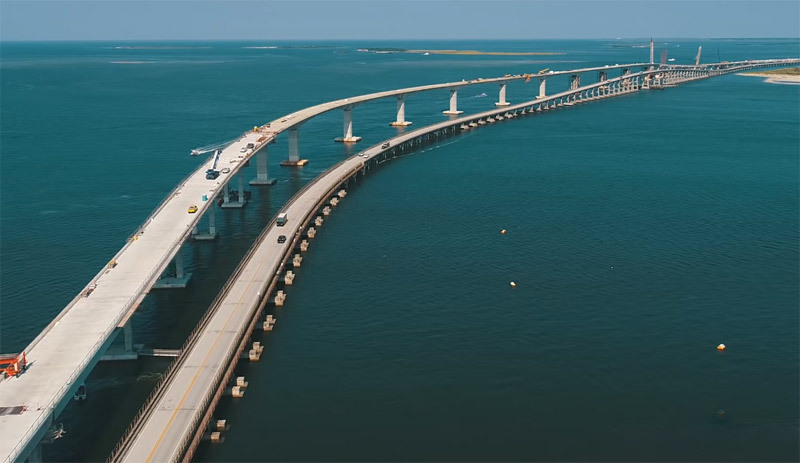 The bridge covers a span of 2.7 miles, connecting Hatteras Island to the mainland, allowing for easier access to and from the island for both residents and visitors. 1990: During a storm a barge hit the northern end of the bridge causing severe damage to a few of the spans. The bridge was closed for 6 weeks while repairs were done. The only access to Hatteras Island was by boat, ferry, or airplane. 1990-2010: Surveying, environmental impact studies, and other analyses are done on the area of the replacement bridge - ultimately resulting in awarding permits and contracts to proceed with the project. 2011: NCDOT awards contract to a design-build contract. Construction is scheduled to start in 2013. SELC files lawsuit to stop the bridge project, delaying the start of the project by three years. 2015: A settlement agreement is made allowing NCDOT to move forward with the replacement project. 2016: NCDOT breaks ground on the replacement bridge, marking the beginning of construction. 2019: The new replacement bridge is completed - opening to traffic in mid-February. With the completion of the bridge, all we can say is a big THANK YOU to everyone who helped to get this replacement project off the ground and completed. Hatteras Island now has a safe way of passage on and off the island. A Community Celebration will take place on February 9th from 10am – 4pm. Following some brief words and dedication, everyone is invited to walk or bike along the new bridge.